Questions remain over what, if any, National Party involvement there was in Jami-Lee Ross’ admission to a mental health facility in Auckland over the weekend. The New Zealand Herald on Sunday reported that it was told by someone close to Ross that he’d been taken by police to a facility. It reported Ross had been “sectioned,” meaning he’d been taken against his will, and was “not in good shape”. Following a tumultuous week, Ross on Friday announced he was no longer resigning from Parliament. Although he’d been expelled from the National Caucus, he committed to remaining in Parliament as an independent MP for Botany to keep dishing out dirt on National. 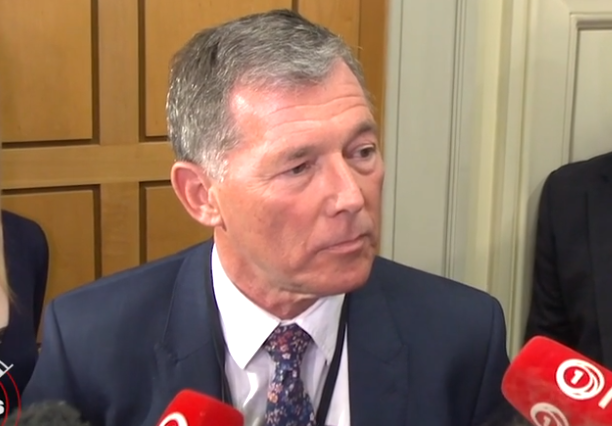 Asked on Tuesday about any National involvement in Ross being taken to a mental health facility, both National Party President Peter Goodfellow and Leader Simon Bridges were cagey. Goodfellow said he had called Ross’ wife to offer his support, but her phone was switched off. “Jami-Lee is also, to the extent that we can, getting support from the party and from people in the party that know him. But at the end of the day, this is a very traumatic time for all of them,” he said. “This is a matter to do with one of the MPs though, and given those circumstances, I’ll just leave it for somebody else to answer that question. Bridges said he wasn’t concerned about National being involved, even if he wasn’t aware of any involvement. Bridges said he wasn’t aware of any allegations made about Ross’ behaviour, as Leader, until his expenses leak investigation started. He said an internal review of the party’s culture would be conducted – the findings unlikely to be made public. Left-leaning political commentator Chris Trotter believes the public has a right to know what part, if any, "the most obvious beneficiary of Ross’s extraction from the political environment" – National – played in his detention. In a blog post, Trotter questioned: "Who is in possession of Ross’ property? His family? The unnamed mental health facility detaining him? The Police? The National Party? What, if any, obligation are those holding Ross’s phone, his laptop, his hard-copy files, under to keep them safe from prying eyes? "What, if anything, has been happening at Ross’s home and/or his parliamentary and electorate offices in the time that has elapsed since he was taken into state custody? Has anyone come calling? If so, who was it – and what were they after? "The public has a right to know the answers to these questions. "That would not be the case if Ross was just another citizen, but he is much more than that. Ross is someone who has promised to expose what he alleges to be the corruption and moral failings of at least some of this country’s leading parliamentarians. "When a person promising revelations of this kind is suddenly uplifted and immured in a secure mental health facility, the public has a right to know on whose authority it was done; how it was accomplished – and to what purpose?" This could be a make or break moment for the Nats, in the context of this term of parliament. It could weld them together or it could blow up in front of them (another leadership debate). I would counsel cool heads just now. You've got sticky situation on your hands - you don't need to make it any stickier just now. While I can understand your argument to a degree, the issue is he is a sitting MP, paid for by the taxpayer, and where he finds himself is largely due to how he conducted himself in that capacity. People will naturally want to know what happened. During this whole debacle he was charging us for his time. The thing is we don't know and have no reason to be told what is the nature of the his affliction - it most likely has nothing to do with his role as an MP. It is a private matter. Yep, in the same week his career capitulates he is admitted to a mental facility. Both mutually exclusive events right? Assumptive - we don't and have no need to know why - it's not our business. This is our business. It's important to know why someone is sectioned, especially a political figure. Such things have been known to be abused. Very early on any mental health issues should have been addressed. The hunt for the leaker should have gone on until that person presented with a medical certificate. Appropriate and humane action could then be taken. Of course the media will ask, but the point is, the National Party bungled the answer - which is exactly as you have said: for privacy reasons we have no comment. Unless (warning! conspiracy theory follows) orchestrated by the Nats! The may have the connections but probably not the expertise, and it would be ridiculously risky. Completely unlikely, to my mind. On the other hand, trying to push someone into a breakdown is something else. I saw on WhaleOil, Cam Slater arguing the Nats were running a hit job to deliberately undermine JLR's mental illness. I would not be surprised to see things escalate further, even still, based on other comments in Cam Slater's post. I have just added some comments to the story from left-wing commentator Chris Trotter, who explains why he believes the extraordinary circumstances around the Ross situation make his admission to a mental health facility the public's business. You can read his full blog post here. Interesting comparison - it reminds me that the Soviet's developed a definition of schizophrenia that was so broad anyone could be considered insane. HIs thoughts mirror my own, it's quite "handy" that Ross has been sectioned, who's actually allowed to make that call? Whilst he's away, I'm expecting a volte-face, a cushy job for life somewhere in exchange for his silence. Regardless of any one else’s opinion or motives and the surrounding hype, the man is ill. Anybody who is ill requires treatment and that process must be kept private for reasons that any normal person should understand, because each and every one of us would expect exactly that, if we were in the same unfortunate circumstances. "Ross was admitted to mental health care in Auckland at the weekend following a tumultuous few weeks. His admission raised fresh questions about Bridges' judgement in calling an inquiry and publicly naming Ross after being told the MP had a breakdown." The only thing now is be open and honest - don't lie or just as bad - be "evasive" . If you have a leak,it must be fixed or a flat tyre is the outcome. O thers outside the Nats need to own up to this,media,family friends etc. Not sure what you are trying to say here. The National Party have a duty of care to Ross as an employee. If they are aware of any issue that could be exacerbated by their actions it's best to take a cautious approach and consider the consequences. What i am saying is that family and friends are usually the first to pick up on different behavior and i will say from my own experience with a family member,reluctant to do anthing about it. One of the reasons given for not doing anything is the embarrassment bought to the family. JL Ross is an employee of the National Party?? I don't think so. Why do they think that being "cagey" is going to work for them? A simple planned statement that for privacy reasons - they have no comment on the circumstances of JLR's admission. How easy would that have been. Far more honest than an attempt to distance themselves - when in fact they were his employer, and they made plenty of mistakes leading to his demise. Where is this stupidity that Ross is an employee of the National Party coming from. A political party is a group of people who get together for a common interest. Although it's hard to do alone, you can become an MP without ever having anything to do with a party. An MP comes to Parliament by persuading enough people to vote for them, so most form groupings. And democracy is great because those groupings can change, split and or merge. The trick is that the new group has still has to get votes and that is where us voters crush them, if we choose. A caucus is a mere subsidiary of it's members. Formed and reformed as they choose. Another stupidity was advocacy that parties had to have diversity and gender balance - it had to be a rule. My view is that any intended parliamentary grouping can define their membership as they please, even offensively. And then we the voters can install them as we choose. Or completely ignore them. Events prior to Ross' sectioning and his sectioning. Ross' behaviour prior was unacceptable. He clearly undertook to bring Bridges down in which he broke trust and confidentially in releasing Bridges' expenditure and recording (and possibly coercing) what were supposedly private discussions. When it turned to custard he announced that his scope was wider; i.e. to bring the National Party down for which he has no mandate given that he was on the National Party ticket and an unwillingness to seek that mandate in a by-election knowing that he would not get that mandate. For this he has no credibility. As to the second issue mental illness - or any illness - is not wished on anyone. Press coverage - or the lack of any comment by National or Bridges - clearly indicate that there is currently no desire to continue the disagreement whilst Ross is in this situation. I do hope for Ross' speedy recovery and trust that he is able to rebuild his life which at the moment must seem very devoid of positives. At some stage, the Guy at the Top has to take responsibility for what happens below him. That's been Bridges failure all along. He mishandled The Leak'; he mishandled the expose of such and has continued to mishandle every ongoing aspect of this saga - ( this report!). He hasn't got his troop under control. And if that's what we get as a Party Leader/aspiring PM, then the future doesn't look too bright - and that's not only for JLR. Both of you issues are not the issues. This issue is did the National Party commit a crime regarding donations. The rest is of entertainment value only. As we don't have a Nat govt I have some hope the Police do a thorough job - search warrants on phones, bank accountants, computers for a starter. Throw the book at them if you find any offending - they are dicking with our democracy - something the media seems to have overlooked. This point seems to be lost in the poop slinging. The big issue for me is the extent that all things NZ have been for sale during the last National administration. All for sale from unpatriotic NZers like the one who likes living in Hawaii anyway. Jami-Lee Ross - just taking a little break with the head of Interpol? Or perhaps a short stay where Fan Bingbing went on 'holiday' whilst being re-programmed? So while we have Sir John Kirwan and Mike King getting out there and telling people it's okay to ask for help, Jamie Lee-Ross has been admitted for Mental Health issues and ridiculed for it by the media and the general public. No wonder we have such a high suicide rate, we're a disgusting bunch of people. Surprised to read the amount of supposition and rumor mongering here. Thought I'd accidentally clicked on Stuff or, even worse, NZ Herald. I'm looking forward to interest.co.nz returning to their tagline "helping you make financial decisions". An opinion shaping article masquerading as News doesn't even get close to the stated primary objective of the website. Yes, people may be interested in who initiated the sectioning. Likely candidates may include wronged/abused co-workers, family members, or even National party members. Until there is some factual data, speculating about the origin is just that, speculation, and isn't news but instead opinion. When there are objective data that corroborates the rumor mill, at that point make an "News" article (hopefully, if it has some bearing on the NZ or world financial markets, or market understanding). First, consider what it is that the website is trying to achieve. Providing counter-balance to WhaleOil doesn't seem to be in line with providing objective financially oriented news. Its easier for a camel to pass through a needle than the average citizen to be admitted to a mental health facility in this country. There is usually weeks and months of distress for families and individuals before a bed is available. So how did Jamie-Lee Ross get admitted so quickly? For less emergency cases sure. But in suicide & high risk cases availability is there so long as another high risk case still recovering is pushed out. They even had overflows of women go into the men's ward with prisoners and known sexual offenders. So the capacity issues are still there but you can queue jump through almost dying, which since mental health treatment is so poor for mid to low levels it really is only at the bottom of the cliff people can get help. Underfunded health care bites everyone in the end. The fact that neither senior National functionaries cannot give a clear and unequivocal no to these questions almost certainly means that the party or somebody close to the party has precipitated Ross's detention. The political risks of not being absolutely squeaky clean (as opposed to some legalistic slight of hands "innocent", as per anonymous donations), means that they have done something desperately stupid, or more probably they have put themselves at the risk of digging themselves into an enormously larger hole, because there are other facts that Ross can release that will devastate National. Either way this looks absolutely shocking and more in line with sort of things one expects from Putin's Russia. I doubt that it would make it into the plot of the House of Cards. The National Party is implicated in the issues of donations, potential pay for play, lack of the national interest, and a lack of transparency. So the source of information is being dealt to/with. How compliant does the NZ citizen want their media to be? The Saudis got em, hes probably at that empty abattoir in the middle-east as I write. Scary that they couldnt/wouldnt give a straight answer. Sorry,Jenée, I didn't realise you'd updated the article and linked to the Trotter post already. BTW, I saw somewhere, David Seymour saying a very similar thing (on Twitter, I think? ), something to the effect of this having constitutional implications. And did Trevor Mallard yet signal that he had been informed by the relevant authorities? The friend said that Ross was no longer the subject of a compulsory treatment order, meaning his care would not trigger a court hearing or a notice to Speaker Trevor Mallard. It's curious that we live in a time where people blast their personal health stories far and wide, to the extent that Give A Little pages are established to solicit money from the general public. However, only some health issues can be turned into a commodity, while others render cries of "privacy" or "off limits", specifically mental health. That's an interesting reflection on our society as a whole. Well, as we have observed recently, mental health issues can have quite an impact on things. You could say its stigma is deserved. I’m not a medical expert however have seen enough mental health cases to recognize that JLR was/is extremely unwell. I give labour kudos for staying right out of it. Not so WP, who had to get his two cents. My gripe is with the media, who frankly should respect this chaps privacy, and refrain from publishing anything associated with this matter. A sad day for journalism imo. I disagree. He is a public figure. This is a "Greek tragedy" that we can all learn from. Perhaps his trajectory could have worked, think Trump, but unfortunately he was no 'superman' like Trump. Probably fortunately for the rest of us. Also this is what "journalism" does. Every day is a sad day for journalism or a great day depending on your viewpoint. Nope. MSM let the side down again. They have focused on the personality - not the message. The message was donation corruption by the Nats. Where has that story gone huh? There’s nothing to see. All smoke and mirrors. Btw I would hate to be your family if you suffered similar, and they were dragged through the media. So Mental Health is a non-issue if you work in certain careers? Investors in Richina, including Mainzeal directors Richard Yan and Dame Jenny Shipley, now have stakes worth millions - on paper at least. National would be quite happy to keep him in a straight jacket, drugged and gagged.